The MTN App of the Year Awards has grown in stature over the years, showcasing what the judges called 'phenomenal' innovation. On-demand cleaning services app Domestly is positioned for fast-tracked growth, thanks to its recent win in the fifth annual MTN Business App of the Year Awards. The innovative app was named the overall winner in this year's challenge, which recognised eight leading apps out of a field of over 450 entries. The awards see winning apps securing prize money, exposure, and the MTN badge of 'APProval'. Domestly, a start-up that connects cleaning professionals directly to homeowners via mobile, aims to make housekeeping more affordable and accessible to everyone, and at the same time create business and opportunities for cleaners. The app makes it easier to browse, book and pay a cleaner, and allows cleaners to manage their money and find maps and directions to each booking. Domestly has created 600 sustainable jobs in the six months since it went live. 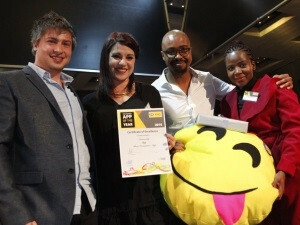 The app was crowned overall winner and best consumer app at the MTN Business App of the Year Awards ceremony, staged in Sandton. Now regarded as the country's premier app awards and a key platform for local developer ecosystem development, the awards recognise innovation in the categories Best Enterprise App, Best Consumer App, Best Enterprise Development App, Best Breakthrough Developer, Most Innovative App and Best Mobile Gaming App. Mandisa Ntloko, head of Marketing at MTN Business South Africa, said: "The MTN Business App of the Year seeks to discover apps that are really groundbreaking, that are really going to change people's lives." The challenge aims to be the champion of South African app development, helping turn its winners into household names. Past winners include WumDrop, M4Jam, DStv Now, Rea Vaya, ViGO, SnapScan and FNB Banking, all of which went on to sustainable growth. MTN Business SA Chief Enterprise Officer Alpheus Mangale noted: "Through the MTN Business App of the Year Awards, we want to ensure that app developers across South Africa are able to monetise and commercialise their smart technological ideas with ease, contributing positively to economic growth and the recognition of South Africa's developer community as true innovators." Berno Potgieter and Thatoyaona Marumo, founders of winning app Domestly, described their win this year as "a great validator for us after all the hard work, sweat, pain and the roller coaster ride we have been on in the past two years". The Domestly app is expected to revolutionise the domestic cleaning industry by allowing customers and cleaners to connect directly via mobile. For clients, it makes it easier to browse, book and pay cleaners when and where they need them. For cleaners, the app enables them to manage bookings, manage their money and find maps and directions to each booking. iKhokha is described as the ultimate small business application, enabling any SME to accept cash, card and mobile/QR payments as well as take an optional cash advance based on trading history. The Cash Advance offered is calculated on your card transaction history and is closely linked to the user's average monthly card spend. Additional functionality includes the ability to track business sales, sell airtime for a rebate and refer friends for R100 cash. HearZA, a national hearing test app, is described as a world first, offering clinically valid hearing tests on a smartphone in under three minutes. HearZA was launched on World Hearing Day 3 March 2016 as part of a WHO initiative highlighting hearing loss as the most common chronic disability. HearZA's vision is early detection and linkage to care as the key to eliminate avoidable hearing impairment. Tuta-Me is a secure, innovative and easy-to-use platform aimed at connecting tutors and learners. The app lets students find the tutor nearest to them, who is vetted and rated. Videokeys Keyboard is a keyboard app for iOS. It is the only keyboard that allows the user to set a video background on the keyboard. With a range of customisation options, it supports all the latest iOS features such as 3D Touch, making it much faster to enter the hard-to-get characters, and offers Low Power Mode to help save battery life. Users have a choice of over 120 different fonts; they can also draw anything right from the keyboard and send them to friends, or insert text on any photo from the keyboard. Friendly Math Monsters for Kindergarten is described as much more than a 'drag-and-drop maths game with cute, interactive characters'. It is a fun and challenging way for kids, aged six and under, to learn and play. Targeting kindergarten and first grade children, young children can use the app to explore a rich and vivid monster room setting, engage and interact with colorful and fun monster characters, all while practising critical early maths skills. KaChing is a patented cashless parking service that gives users seamless entry and exit to malls (currently Melrose Arch, Campus Square, Morningside Shopping Centre, Thrupps and The Pavilion), without the hassle of pay-station queues, lost tickets and needing to have change on hand. After downloading the app, the user simply enters his or her number plate details and loads a credit card or tops up with a prepaid voucher. When arriving at or leaving a KaChing-enabled site, the boom will open and the parking fee will be automatically deducted. MiBRAND helps shoppers find special offers in retail stores and restaurants nearby, noting the user's location and sending a live feed of specials in the area. Users can get instant GPS directions, share information with a friend, and follow favourite stores for updates.